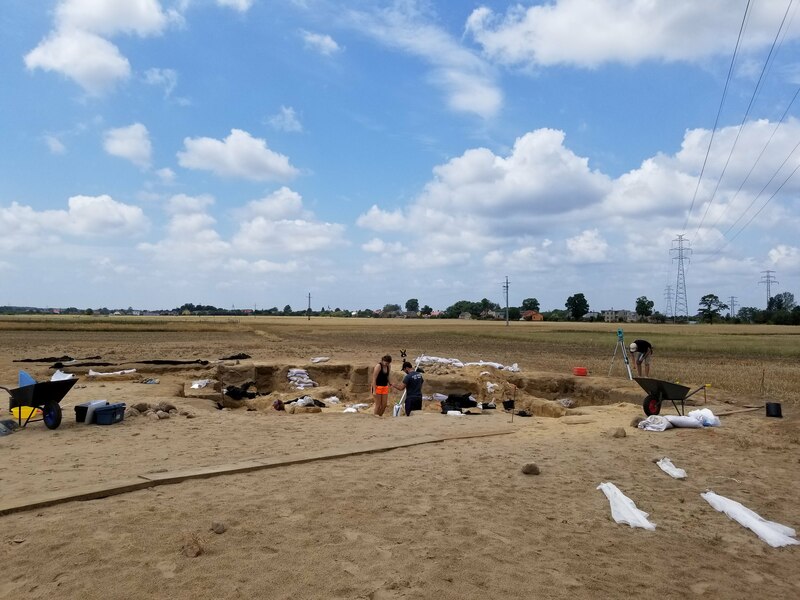 It was mid-June when I found myself in the middle of Poland signed up to participate in Slavia Foundation’s archaeological field school. The site had both Bronze Age (IV and V Period) cremations and Early Modern (16th -18th century) coffin burials. On the first day, the instructors taught us how to say hello in Polish (dzień dobry) and made sure we knew the rules about taking pictures at the site. Taking photos in archaeology can quickly become problematic. There is a fine line between showing the hard work archaeologists do and being disrespectful to the human remains we handle. Pictures taken of us working at the excavation site was not the problem; it was how we posed with the remains that required more discernment. Even when these rules are followed, people can still get upset. Victoria Swenson, the osteology instructor, said that a few years ago a student uploaded a few professional-looking photos of herself working at the site. However, her family became very upset upon seeing the images. “It’s just whatever you think is okay, some people might not. And you just have to understand that,” Swenson said. A lot of information can be found from excavations. For example, the coffin burials from the Poland site have excellent preservation, so nearly whole skeletons that are a few hundred years old were uncovered. This can tell us who lived in the area at the time, the health of the population, what people died from and many other fascinating things. But no matter how much information a bone can tell us, archaeologists have a primary responsibility to consistently show respect for the human remains. Even when being very careful, mistakes can happen. During the summer, a student accidentally broke an urn that had cremated human remains from the Bronze Age. Although the urns only held burned and fragmented remains, Valerio pointed out how archaeologists always need to be careful with handling human remains. Even when archaeologists are extremely careful and do not make mistakes in the field, their online presence can be a problem. A few times now, the archaeology instructors through the Slavia Foundation have had to ask their students to take down inappropriate pictures. Still, while social media can be problematic, it is necessary for outreach.